Despite being vaguely on the backpacker route, Laos still isn't as popular as its neighbours Thailand, Vietnam or even Cambodia, which is both good and bad: good because there are far fewer annoying backpackers and Laos still feels 'authentic', bad because in South East Asia 'authentic' can often mean not so vegan-friendly. 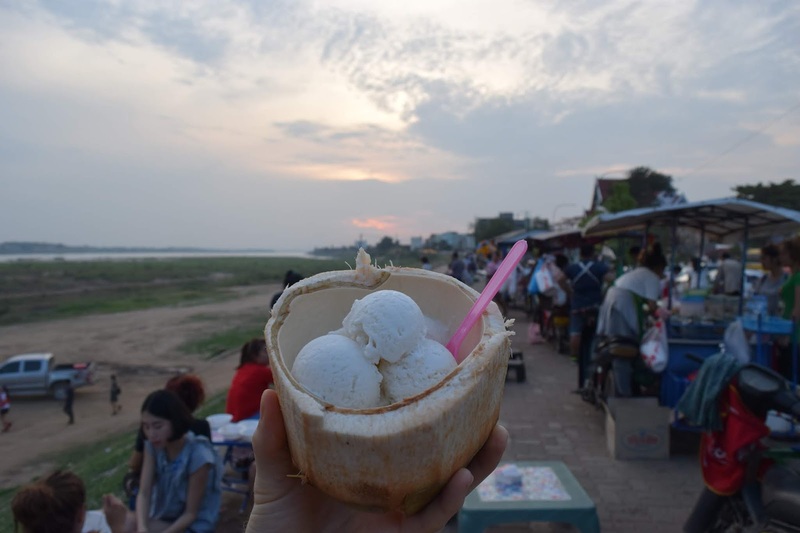 But don't worry, with this guide to being vegan in Laos, you will have everything you need to explore this beautiful country as a vegan! First things first, what are some traditional Laos vegan recipes you can enjoy all over this beautiful country? Yall Dib are beautiful healthy vegan-friendly fresh spring rolls. You'll find spring rolls all over South East Asia, but each country does them a little bit differently. 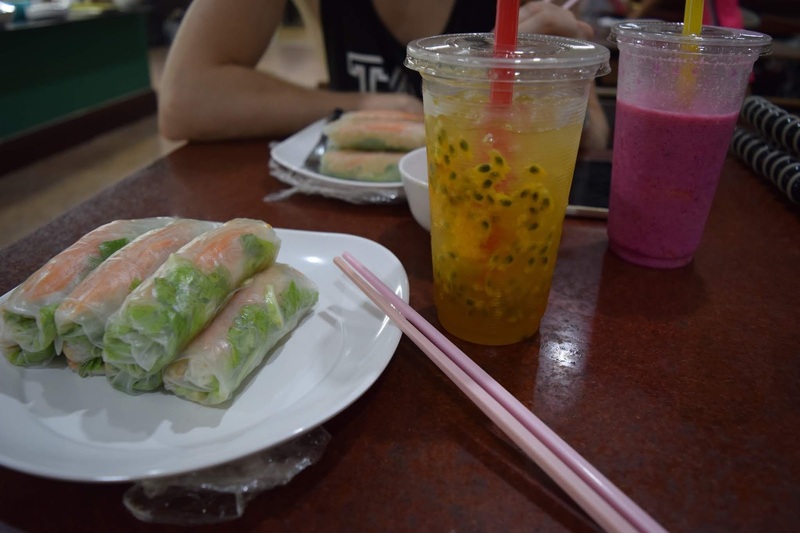 In Laos, the fresh spring rolls are filled with fresh vegetables and noodles. You'll find meat and fish ones too so make sure you ask for vegetable yall dib. 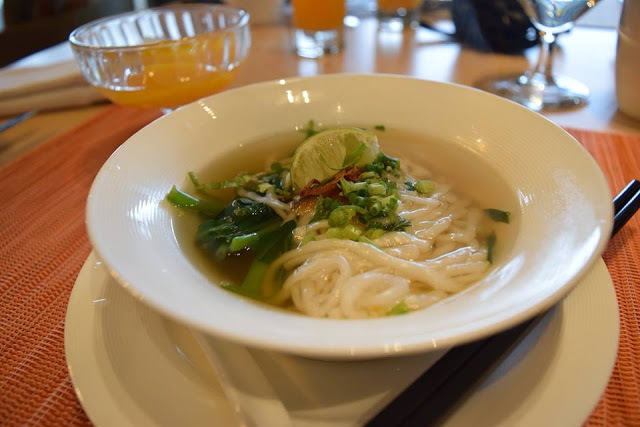 Khao piak sen is the Laos version of Pho - it's a beautiful noodle soup served with lime and fresh herbs. It tastes really refreshing and is super filling. I highly recommend having it for breakfast. Cheun Yaw are similar to Yall Dib (the fresh spring rolls) but this time they are deep-fried - hence they're not as healthy, but are insanely delicious. 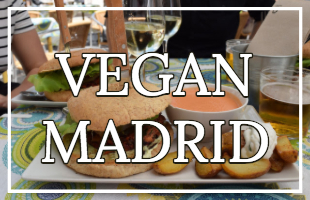 You can find them as the perfect vegan backpacking food - aka street food, they are everywhere! As always, check for meat before purchasing. 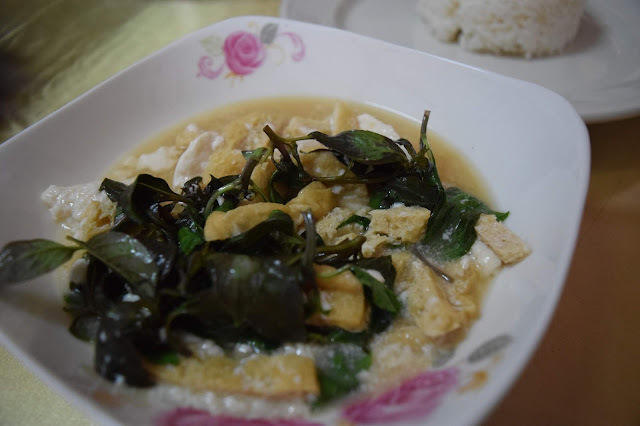 Probably not the most authentic Laos vegan recipe ever, but the absolute perfect snack to cool you down in Laos's super hot temperatures. At the night market in Vientiane, I found some coconut ice cream served in a coconut, so cute! 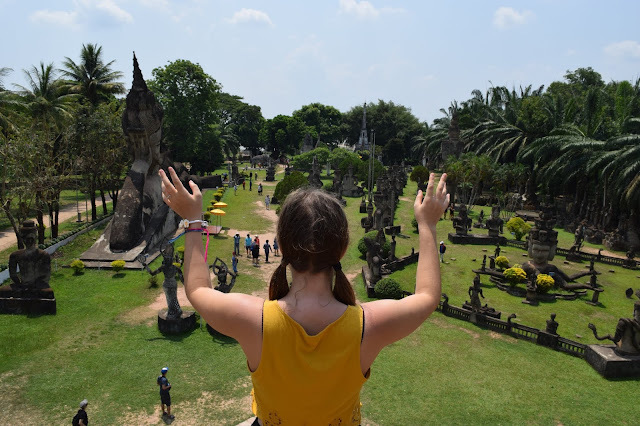 Vientiane is the capital of Laos, but Vientiane is often skipped in favour of more popular Luang Prabang - that alone was reason enough for me to want to visit Vientiane. You can take a night bus there from Chiang Mai or a train from Bangkok - I did both, the night bus surprised the crap out of me by giving us vegan snacks (there were even cartons of soy milk). The train is super not vegan friendly (people selling street food hop on and off every few stops, but none of the things they sold were vegan). 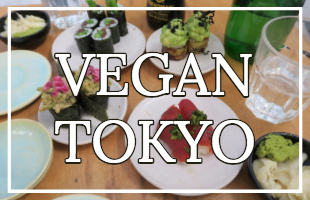 The train takes ten hours so plan accordingly - take vegan-friendly food with you! Reunion Cafe was so delicious I went there nearly every day. They offer loads of different vegan options - some Thai, some Chinese, some traditional Laotian. I really recommend the 'chicken' strips. Meals cost between 15K and 30K ($1.50 - $3.50) and they do takeaway too. Note, they only really accept Lao Kip here, but they will let you pay in USD (and then give you change in Kip). [Side note on the currency: The official currency is Lao Kip, but Thai Baht and American dollars are accepted in certain places/depending on certain people, and generally if you pay with those you'll get Lao Kip for your change. 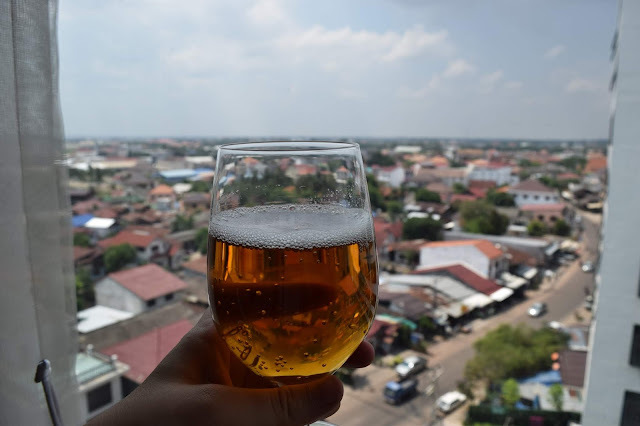 If you're looking for something a lot more budget friendly try Pacific Vientiane Hotel, with free-wifi and use of bicycles this is a cute place to stay. Rates are around just £20 a night, and breakfast can be added for as little as £3. 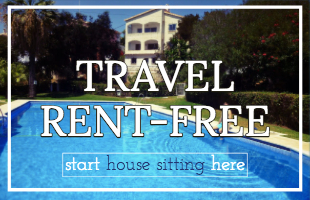 For up-to-date rates click here. 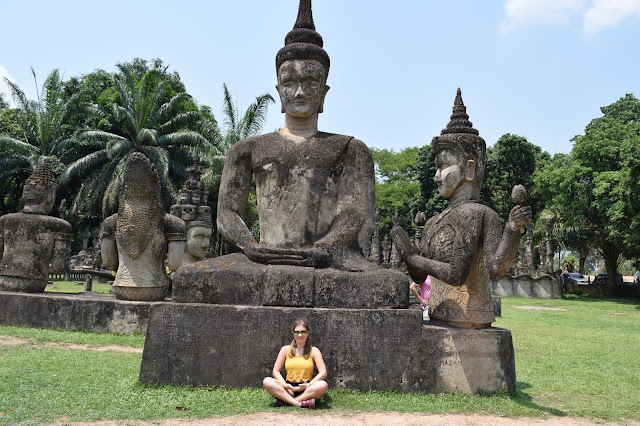 Visiting the Buddha Park is a great way to spend the day in Vientiane - the statues are fascinating and beautiful. 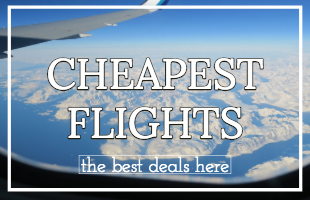 Don't listen to your hotel or any tour company - there is absolutely no need to take a $50 tour with them to get there. Literally, you can take the bus there by yourself for $1.50, it's super easy and a lot more fun. You can't visit South East Asia without going to a market, you'll find things there you've never seen before and they are so awesome. Night markets are even better - the night time temperatures are a lot more forgiving. Vientiane does an awesome night time market that has a rare commodity - it's almost devoid of tourists and backpackers! Unfortunately, tourists ride elephants all over Laos, don't be one of them! This is not vegan Laos. Riding an elephant is super cruel and probably one of the worst things you can do as a travelling vegan. 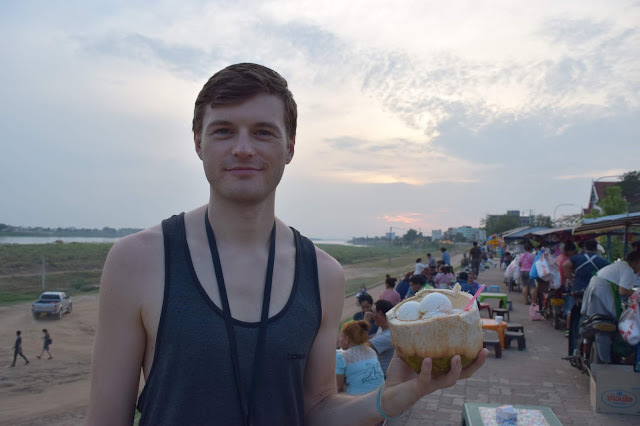 So there you have it, hopefully, this guide has answered all your questions about being a vegan in Laos, if you have any queries or tips for others let us know in the comments below! 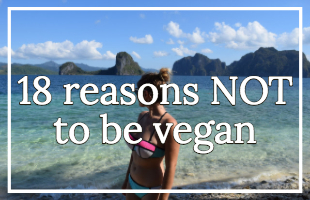 Is it hard to be vegan in the Philippines?